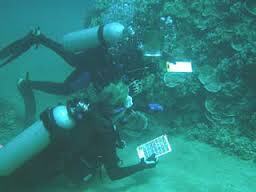 There is a high demand for underwater communication systems due to the increase in current human underwater activities. Underwater communication systems employ either sonar or electromagnetic waves as a means of transferring signals. These waves are different physically and electrically, and thus the systems that employ them also differ in their design architecture, wave propagation and devices used for emission and reception. As a result, the two systems have varying advantages and limitations. This paper presents an in-depth review of underwater communication based on sonar and electromagnetic waves, a comparison of the two systems and a discussion of the environmental impacts of using these waves for underwater communication. In the tradeoff between preserving the underwater environment and the need for underwater communication, it appears that underwater electromagnetic wave communication has the most potential to be the environmentally-friendly system of the future. Sir, please send full report about U”nderwater Communication Systems” to my mail id: krishmunna201@gmail.com . thanks in advance and waiting for ur reply…. This is new concept and it seems interesting.. i am willing to give presentation on this topic so i need full report on this. kindle send me full report file on my mail id : harsh.khunteta@gmail.com. it is an excellent and new idea….i am willing to give paper presentation on this topic…..so plz…plz send me the total report on this topic..my emailid is paletimounika.mouni@gmail.com…thank u..
sir,this topic is interesting and i wish to give seminar on this .so please send me full report and ppt also. please please,as soon as possible. please send me total reports and ppt of this topics as soon as possible….